Jeanne and Charlie Stallings at The Point. Photo by Marc Hall. It all started with the Wolfpack Club. Charlie Stallings graduated from NC State with a degree in business management in 1977, and to maintain his connection with his alma mater’s athletics teams, he became a donor soon after. “I enjoyed football games and wanted to continue to get tickets, but then it became about doing more for the university,” Stallings said of his evolving motivation for support. “More for the university” has taken many forms. In the 1990s, Stallings worked with the Alumni Association to organize the NC State Club of Richmond, where he and his wife Jeanne still live. One of the club’s first projects was launching an NC State-branded Virginia license plate. To help promote the initiative and increase recognition of NC State in his home state of Virginia, he donated funds so area alumni could get the plate for free. As Stallings’ involvement with NC State deepened, his giving has expanded to include endowed support for strategic priorities. When he was approached about supporting scholarships at the Poole College of Management, he reflected on his own experiences as a student. “I recognized how important it was to have some assistance,” he said. In 2012, he and Jeanne endowed a fund of their own. The Charles E. Stallings Family Scholarship supports students at the Poole College of Management who demonstrate financial need. For Stallings, a senior vice president with BB&T Capital Markets’ Institutional Fixed Income Group, the fact that an endowed scholarship will help students not just for one academic year but for generations to come is crucial. He knows that the importance of the university having funds to invest in order to generate income for uses such as scholarships in perpetuity might not make for the flashiest pitch. However, endowments are critical to NC State’s goals. “That’s what’s going to make this university even greater: having the funds available to attract and retain the best faculty and the best students,” he said. NC State’s Think and Do the Extraordinary Campaign has created multiple opportunities for the Stallings family to increase their impact. 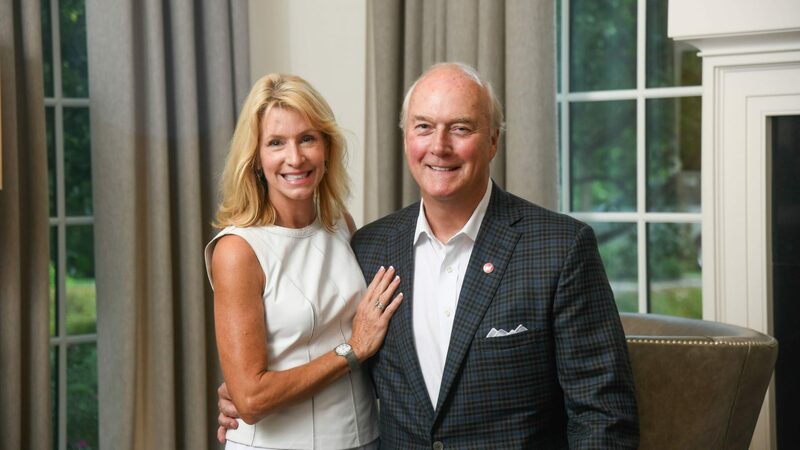 They have given back to the university in three vital ways: providing annual gifts to the Wolfpack Club and the Poole College of Management, strengthening their endowed fund and making a documented estate gift. In addition to his philanthropic partnership, Stallings has established a record of dedication and leadership to the university. He has served as president of the NC State Club of Richmond, as a member of the NC State Investment Fund Board of Directors, and as former vice chair and current chair of the NC State Foundation Board. He enjoys working with his fellow board members and connecting with people who love NC State and are passionate about setting an example by giving back. The impact of Stallings’ commitment to serving current and future alumni through leadership and philanthropy can be seen across NC State. What began with wanting to stay connected to NC State athletics has grown into campus-wide support and a legacy that will endure for years to come.